LONDONER John Donovan has now won both tournaments that he has entered on the Cuestars Under-21 Bronze Tour. 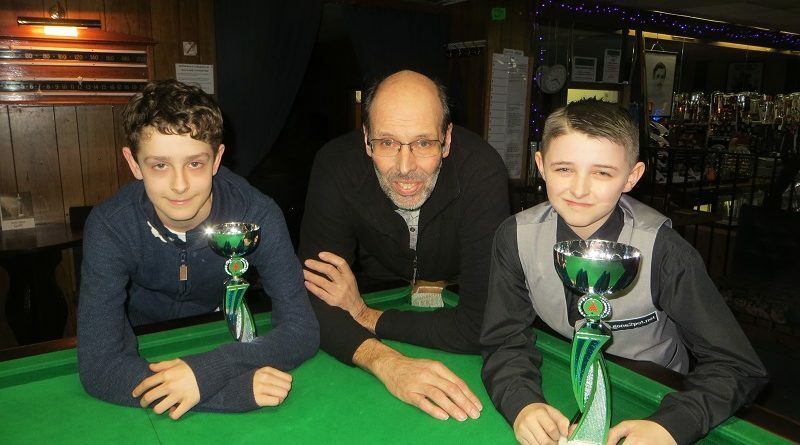 The 13-year-old from Somers Town followed up his success in Coulsdon in December by claiming the eighth leg at Top Spot Snooker Club, Havant. Donovan, who is based at the Kings Cross Hurricane Room and was accompanied by his World Snooker coach John Woods, beat leg-six winner Adam Cowdroy (Bournemouth) 2-0 in the final. Donovan, who lost to Cowdroy in the group stages, recorded the day’s highest break of 32 in his 2-1 quarter-final victory from 1-0 down against rankings leader Owen Jenkins (Havant). Nine-year-old Harry Wyatt (Ferndown) knocked in a 30, one below his personal best, in a 2-1 last-eight defeat by Thomas Sharp (Portsmouth). Second-placed Sharp closed the gap to 14 points after a 2-0 defeat by Cowdroy. It was his seventh semi-final exit out of eight this season. Tyler Mack (Waterlooville) qualified for his first knockout but went down 2-0 to Eddie Mason (Salisbury) in the last-eight. Mason progressed to the semis for the first time before going out 2-0 to Donovan. And third-placed Dylan Smith (Tunbridge Wells) was the big-name casualty from the group of death that contained both finalists. John Donovan: 32, 26, 24. Thomas Sharp: 27, 22, 22. ROUND-ROBIN GROUP A: 1st, Owen Jenkins (Waterlooville Sports Bar); 2nd, Thomas McEvoy (Salisbury SC); 3rd, Katie Griffin (Jesters, Swindon); 4th, George Laxton (Waterlooville Sports Bar). ROUND-ROBIN GROUP B: 1st, Thomas Sharp (Waterlooville Sports Bar); 2nd, Tyler Mack (Waterlooville Sports Bar); 3rd, Will Kempson (Salisbury SC); 4th, Sam Walter (Mayfair, Gosport). ROUND-ROBIN GROUP C: 1st, Adam Cowdroy (Greenbaize, Bournemouth); 2nd, John Donovan (Hurricane Room, Kings Cross); 3rd, Dylan Smith (Victoria SC, Tunbridge Wells); 4th, Freddie Turner (Salisbury SC); 5th, William Thomson (Chandlers Ford SC). ROUND-ROBIN GROUP D: 1st, Eddie Mason (Salisbury SC); 2nd, Harry Wyatt (Chandlers Ford SC); 3rd, Kostas Ormerod (Chandlers Ford SC); 4th, Daniel Walter (Mayfair, Gosport); 5th, Ryan Wilson (Waterlooville Sports Bar). QUARTER-FINALS (12 points): Donovan 2-1 Jenkins, Mason 2-0 Mack, Sharp 2-1 Wyatt, Cowdroy 2-0 McEvoy. SEMI-FINALS (15 points): Donovan 2-0 Mason, Cowdroy 2-0 Sharp. FINAL (25/18 points): Donovan 2-0 Cowdroy. From left: Adam Cowdroy, sponsor Trevor Sanders, John Donovan.